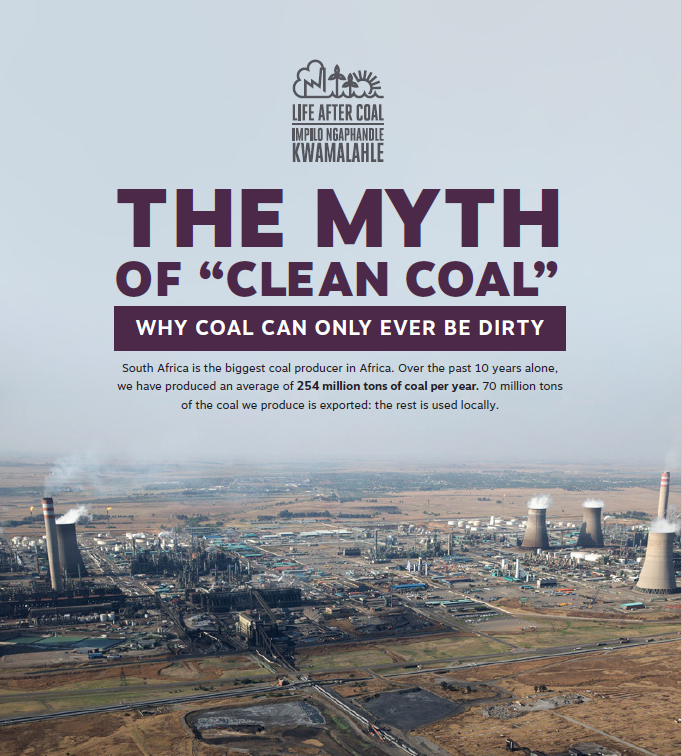 Entitled The Myth of “Clean Coal” – Why Coal Can Only Ever Be Dirty, the report warns that, while “clean coal” is sometimes promoted as the lifeline that will allow governments to continue to depend on coal for energy generation, there is no such thing as “clean coal”. The report investigates the coal cycle and demonstrates the extent and severity of the various impacts associated with the mining, beneficiation, and combustion of coal, and demonstrates that there are no solutions which are able to completely mitigate coal’s enormous resource consumption and harm to health and the environment. The report shows that so-called “clean coal” technologies only exacerbate such external impacts and, if viable at all, result in a substantial increase in capital and operating costs, compared to readily-available, much more flexible and much less harmful wind and solar power technologies. 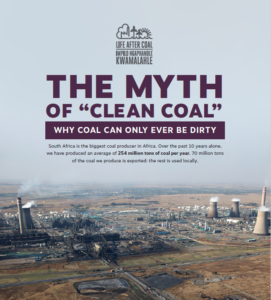 A coal phase-out to enable a just transition to a sustainable energy system for the people of South Africa is of paramount importance and cannot be delayed by the false promise of “clean coal” technologies. Continued reliance and re-investment into expensive, unnecessary, and outdated infrastructure will ultimately be to the detriment of South Africa, coal-affected communities, coal workers, and the unemployed. The October 2018 special report launched by the Intergovernmental Panel on Climate Change, tells us that, to achieve a global 1.5 degree Celsius temperature increase target, we need to reduce CO2 emissions by almost half (45%) in 2030 and to almost zero by 2050. Any prospect of South Africa achieving this trajectory is largely dependent on Eskom actively planning, together with its workers, for a just transition to socially-owned renewable energy projects and a substantial reduction in CO2 emissions. To do otherwise will risk stranding the workforce, along with redundant coal-fired power plants. “Clean coal” is not and will never be the way forward: it is simply a myth. South Africa is the biggest coal producer in Africa. Over the past 10 years alone, we have produced an average of 254 million tons of coal per year. 70 million tons of the coal we produce is exported; the rest is used locally. Eskom burns about two-thirds of all coal used in South Africa in its coal-fired power stations, while Sasol Synfuels uses about one-fifth. The rest is used in a variety of industries, including steel and cement manufacturing. The direct impacts of using coal on health, water, land, and the climate are devastating. Proponents with vested interests in the survival of the coal industry are promoting the idea of “clean coal” technology as the lifeline that will allow governments to continue to depend on coal as an energy generation option, while supposedly limiting its risks and impacts. There is no such thing as “clean coal”. An overview of the coal cycle (mining, production, supply, and disposal) proves that “clean coal” is impossible. There are no solutions to neutralise all – or even most – of the dire environmental, health, and climate change impacts caused by coal. This is especially so in the context of significantly cleaner and cheaper alternative energy sources – such as wind and solar power – that are available in such abundance in our country. The production of 250 million tons per year of coal requires between 42.5 million m3 (enough to fill 17 000 Olympic-sized swimming pools) and 147 million m3 (enough to fill 58 800 Olympic-sized swimming pools) of water. There are no methods that can avoid all or even most of the detrimental impacts of the mining and processing of coal, and none will be available for the foreseeable future. Water consumption: In 2017, Eskom consumed approximately 307 million m3 of water (enough to fill 122 800 Olympic-sized swimming pools) for power generation, amounting to 10 m3 of water (125 bathtubs) per second (largely for cooling, and excluding the water used and polluted to produce or beneficiate the coal). Fine Particulate Matter (PM2.5) pollution from Eskom’s coal-fired power stations alone is responsible for the equivalent deaths of more than 2,200 South Africans every year, and causes thousands of cases of bronchitis and asthma in adults and children annually. If “clean coal” could be applied to the production of electricity using coal-fired power stations, it should mean the avoidance of all the impacts associated with the burning of coal, or at least a very substantial reduction of the consumption of resources and impacts of the combustion process. This is not the case. The following three technologies (not all proven in SA) are generally relied on by “clean coal” proponents, but even combined, these will not provide the substantial reduction that is urgently needed to avoid the dire impacts on human health and the environment. Instead, these technologies would generate harmful environmental impacts of their own. CO2 emissions still remain high (at best reduced by about 20%); and pollutant (PM, SO2, and NOx) emissions also remain significant. HELE plants require a substantial increase in capital and operating costs, in a situation where coal power is already more expensive than available wind and solar power technologies. CFB systems can use lower-quality coal, including discard coal, if lime is injected directly into the furnace to control SO2 emissions. Consequently, the amount of solid waste generated is significantly higher compared to pulverised fuel boilers (used by most of Eskom’s stations). For example, figures from the proposed Thabametsi Independent Power Producer (IPP) station show that for every 1000 tons of coal burnt, this CFB plant discharges 660 tons of ash and spent sorbent as waste. GHG emissions are significantly higher at 1,23 kg CO2eq per kWh due to high Nitrous Oxide (N2O) emissions. With 60 million tons accumulating every year, CFB technology cannot solve the discard coal problem. The use of discard coal in this way will also result in air pollution; the increase in the amount of water used to wash the discard coal; and an increase in the amount of ash and sorbent to be dumped because of the higher ash content. This coal ash contains toxic chemicals such as arsenic, lead, mercury, and chromium, which can cause, among other things, cancer, organ failure and brain damage. CCS technology is considered to be a candidate to capture, inject, and permanently store CO2 emissions (only) underground. There are several unresolved problems with CCS, including uncertainty around long-term leakage, its high capital costs, and the long lead-time – possibly decades – before the technology could potentially be proven at the required scale. Although the South African Centre for Carbon Capture and Storage (SACCS) is attempting to demonstrate that CCS can actually be implemented using South African geology, it remains unproven. The bulk of Eskom’s fleet of coal-fired power stations (12 of 15) are situated in the Mpumalanga Highveld, with two in Limpopo Province, and one in the Vaal Triangle, a far distance from the two identified possible storage sites to be tested. ** This increase in transport costs would likely make large scale CCS in South Africa unviable. * ‘Supercritical’ and ‘ultrasupercritical’ plants operate at temperatures higher than the critical temperature (above this temperature, water turns to steam). ** The Zululand Basin in KwaZulu-Natal and the Algoa Basin in the Eastern Cape. For enquiries, please contact CER attorney, Timothy Lloyd, on 083 275 2010 or tlloyd@cer.org.za.